The Jews were constantly led by satan into a sin. 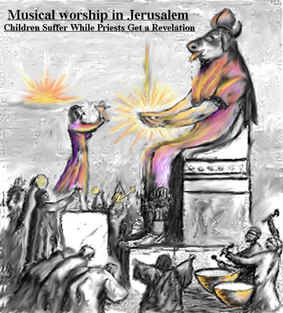 Sometimes they adopted the rites of the worship service from the neighboring peoples: « « And they have built the high places of Tophet, which is in the valley of the son of Hinnom, to burn their sons and their daughters in the fire; which I commanded them not, neither came it into my heart.» (Jer.7:31); put an idol in the God`s house (2Chr.33:15) and chariots before the God`s house. (2King.23:11) etc. But more often they betrayed God by worshipping other gods and bringing sacrifices to them. They arranged sacred groves and made idols to the sun (obelisks) (Isa.27:9; Deu.16:22; Eх.23:24; Eх.34:13; Deu.12:3); prayed to «Ashtoreth the goddess of the Zidonians, Chemosh the god of the Moabites, and Milcom the god of the children of Ammon » (1King.11:33); worshipped «all the hosts of heaven » (2King.21:3); practiced soothsaying, witchcraft and consulted spiritists and mediums . (2King.17:16; 21:6). Basically the gods of the neighbouring peoples were various Baals and Ashtoreths (1Sam.7:4; Judg.3:7). The worshiping of whom included burning babies, ritual prostitution, self- torture and ritual murder of people. The priests of Baal temples were to eat the sacrificed, i. e: human flesh. Word "cannibalism" originated from the combination ‘Cahna-Bal’, where ‘Cahna’ is a form of the word ‘ Cahn ’- the priest. Thus the word “cannibalism” was derived from the word combination « the priest of Baal » (А. Hislop, The Two Babylons, p.232). Cannibalism, lasciviousness, murder are the obvious characteristics of the religions generated by the satan. But the people did not want to see the truth. The vicious customs of ancestors were always stronger than the convincing speeches of the prophets. God punished them. And punishing them He suffered Himself: « For I desired mercy, and not sacrifice » (Hos.6:6). GOD wanted mercy from the people ! God named Israel as libertine and asked through the prophets: «Return, thou backsliding Israel.. I will not cause mine anger to fall upon you: for I am merciful… and I will not keep anger for ever. Only acknowledge thine iniquity that thou hast transgressed against the LORD thy God, and hast scattered thy ways to the strangers under every green tree and ye have not obeyed my voice, says the LORD» (Jer.3:12,13). In the picture: the Jews sacrificed the babies to Moloch- Baal. On dawn the priest put the baby on hands of a stone idol, where was hot ash. Others with drums muffled cries of the baby. And at this time priest received revelation from their god. Satan is very artful. He managed to allocate the majority of the Jews from the true belief. And now in the world very few true Jews –Christians are remained : not only those who accepted Jesus as their Savior but even those who in their belief were guided only by the Old Testament. Among the Jews the doctrine "Cabbalah" is very popular today which is the most dangerous of all ever existing satan`s doctrines..
Cabbalah has neither Jewish nor Christian roots. 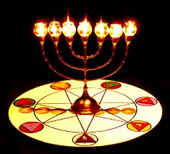 Its basis is- practice of witchcraft , demonology of Babylon, Assyrian astrology, Persian vigilance, dualism , gnosticism and others, that is some phylosophical concepts of pagan religions of the ancient world, which were dressed in images of «Old Testament » and coordinated with mystical authority of the Jewish alphabet. The supporters of Cabbalah believe, that with the help of Cabbalah it is possible to reach the Highest Knowledge and understanding of all reasons and consequences of our existence, i.e. understanding of the Creator. Cabbalists believe, that with the help of spirits of fire, air, water and soil it is possible to make any magic.